Cut is the only one of the 4Cs controlled by man. Based on scientific formulas, a well-cut diamond will internally reflect light from one mirror - like facet to another and disperse and reflect it through the top of the stone. This results in a display of brilliance and fire. Diamonds that are cut too deep or too shallow lose or leak light through the side or bottom, resulting in less brilliance and ultimately, value. Cut also refers to shape - round, square, pear, or heart for example. Non-round shapes, also known as "fancy shapes," will have their own guidelines to be considered well-cut. All Daniel K diamonds are manufactured to the most exacting standards of cut, thereby maximising their sparkle. 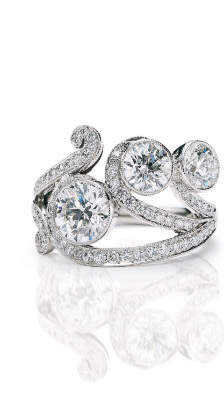 Daniel K collections use white and fancy colored diamonds. White diamonds are usually graded on a color scale which ranges from D (colorless) to Z. This scale refers to the degree to which a diamond is colorless. The less color a diamond has, the more valuable it is. Truly colorless stones, graded D, are treasured for their rarity. At Daniel K, we only use diamonds graded from D to G. These colors are so rare, that less than 1 percent of world's diamond production achieves these colors. In addition to ice white diamonds, Daniel K uses an array of fancy colored diamonds in his jewelery, including yellows and pinks. Fancy yellow colors in particular feature in a number of Daniel K collections. Less than one in 10,000 diamonds is fancy yellow. Inclusions are ranked on a scale of perfection, known as clarity. The clarity scale, ranging from F (Flawless) to Included (I), is based on the visibility of inclusions at a magnification of 10x. The greater a diamond's clarity, the more brilliant, valuable and rare it is. 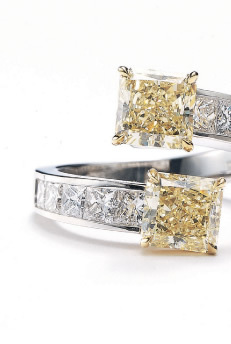 Carat is often confused with size even though it is actually a measure of weight. One carat is equivalent to 200 milligrams. One carat can also be divided into 100 "points." A 0.75 carat diamond is the same as a 75-points or 3/4 carat diamond. A 1-carat diamond costs exactly twice the price of a half-carat diamond, right? Wrong. Since larger diamonds are found less frequently in nature, which makes them rarer, a 1-carat diamond will cost more than twice a 1/2-carat diamond (assuming color, clarity and cut remain constant). 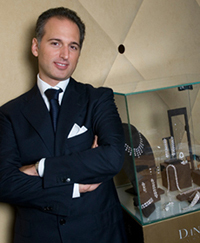 Daniel K specialises in creating jewelry using diamonds that range from 0.50 carat to over 10.00 carats in size.